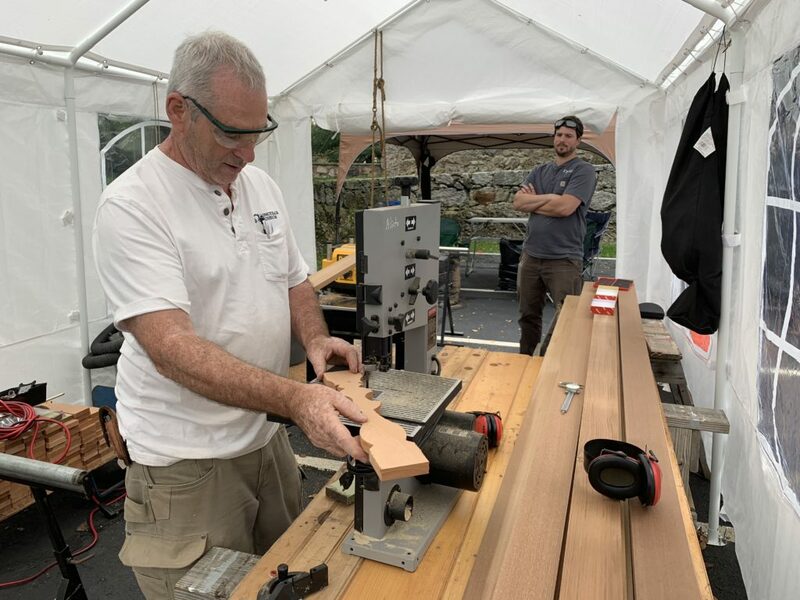 “I have a great affection for Mary Baker Eddy and for what Longyear is doing – that’s why I keep coming back,” says Roger Messman, who recently traveled from his home in Chicago for the third time to help support Longyear’s restoration efforts. Roger Messman and his friend Keevin Schier enjoy volunteering their carpentry skills for Longyear, and the two skilled craftsmen returned earlier this month to work alongside John Alioto and Tim Holzworth of Longyear’s Facilities team. This year’s project was to restore part of the Pleasant View summerhouse, which is located on the Museum grounds. 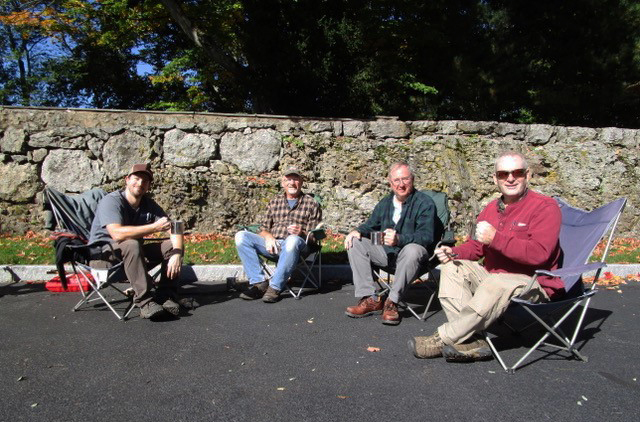 Left to right: Tim Holzworth, Keevin Schier, Roger Messman, and John Alioto enjoy some homemade hot chocolate mid-morning. 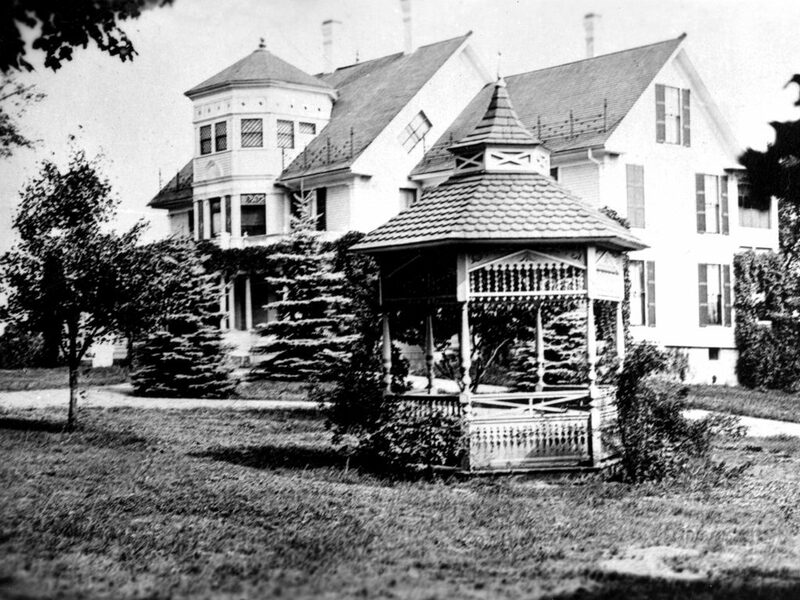 The summerhouse, which once graced the front lawn of Pleasant View, Mary Baker Eddy’s residence in Concord, New Hampshire (June 1892 through January 1908), has been a cherished artifact in Longyear’s collection since 1975, when The Mother Church, The First Church of Christ, Scientist, in Boston, Massachusetts, gave it to the Museum as a gift. The summerhouse at Pleasant View. Photograph, P3038, Longyear Museum collection. 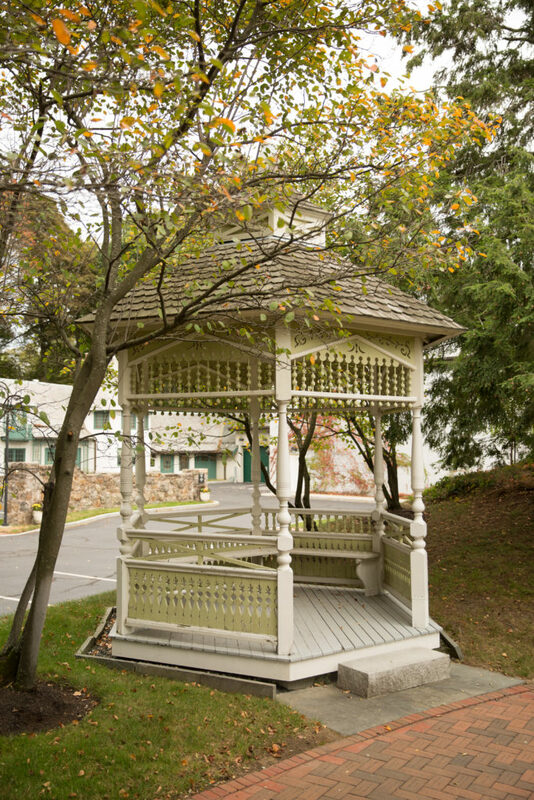 The well-loved gazebo is at least 120 years old and has endured decades of New England weather. Restoring this artifact is a preservation priority for the Museum. After spending months planning and prepping for this project, John, the team’s leader, is happy to begin the restoration process. 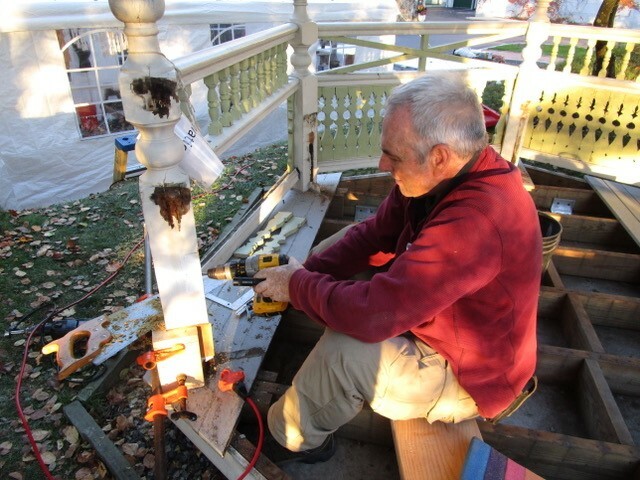 The plan for the project was to restore the railings, trim, balusters, spindles, pickets, and floorboards, which were showing signs of deterioration and weather damage. What made the project more complex than typical carpentry work is that Longyear is in the business of historic preservation. This means that the goal is to save as much of the original as possible. John refines and shapes one of the new decorative pickets. The wood is Sapele, which comes from western Africa, and has excellent properties that will make the summerhouse extremely durable going forward. After coating the spindles and pickets – over 100 pieces! – with primer and hanging them up to dry, Keevin applies several layers of paint. The high-quality paint was imported from Holland and should last a very long time. From demolishing old flooring and installing new deck boards to cutting and sanding pickets, from fastening the newly-crafted posts with TimberLOK screws and epoxy to anchoring the floor framing with angle-iron, the skilled team worked together like a well-oiled machine. Roger saws through the deteriorated posts and replaces them with new bases. The project is a big one, and although the team made significant progress, more work remains to be done until the summerhouse is fully restored. Roger and Keevin are warmly invited to return to Longyear to help finish the job! The summerhouse is a favorite destination on the Longyear Museum grounds.